CHICAGO — For many Chicagoans whose families don't live in the city, Thanksgiving means spending several hours in the airport before and after the festivities. In fact, the Chicago Department of Aviation predicts that O'Hare and Midway airports will see more than 1.9 million passengers over the eight-day travel period this year. Compared to last year, the Aviation Department is projecting a 1.5 percent increase at O'Hare and a 3 percent increase at Midway. So instead of wasting time while you wait to board your regularly scheduled flight or — God forbid — a delayed one, why not try to make the most of it? Regardless of gate assignment, all O'Hare passengers can move freely to Terminals 1, 2 and 3 after going through security, according to the aviation officials. Terminal 5, the international terminal, is excluded because it's not connected to the others. When it comes time to eat, you can skip fast food. Chicago-based Mexican chef Rick Bayless, widely known for his restaurants Frontera Grill, Topolobampo and XOCO, runs the No. 1 airport restaurant in the country, according to Conde Nast Traveler: Tortas Frontera. With three separate locations in Terminals 1, 3 and 5, there's virtually no excuse not to get a griddle-baked Mexican sandwich filled with braised beef, chipotle chicken or garlicky shrimp. Terminal 2: The international airport's namesake, naval pilot Butch O'Hare, is honored with the Butch O'Hare Exhibit. In the '40s during World War II, O'Hare flew a Grumman Wildcat that has been restored and is now on display. For more exhibits and public art, click here. Needless to say, there's a lot to choose from at O'Hare. After a brief history lesson, head to Goose Island Brewery for a craft beer. The Chicago-based brewery has another location in Terminal 3. Terminal 3: Balance your chakras at the airport's Yoga Room, which is open daily from 6 a.m.-10 p.m.
Also, be sure to check out the aeroponic garden, which was the first of its kind at any airport around the world when it was installed in 2011. The garden, which implements a method of growing plants without soil, allows some airport restaurants like Tortas Frontera, Wicker Park Sushi, Wolfgang Puck and Tuscany Cafe to use fresh herbs in their cooking. Have kids? The "Kids on the Fly" exhibit is the perfect play area for tykes. Both educational and fun, the exhibit has a big purple airplane, a control tower and a helicopter model for kids to explore. Next to the exhibit, moms can breastfeed in the Travelers Aid office. Fun fact: There's no Terminal 4 at O'Hare. It used to be the airport's international terminal, but it closed when Terminal 5 was built in its place, according to WBEZ. Terminal 5: Before flying home, Cubs fans can surround themselves with other North Siders at the Chicago Cubs Bar and Grill. For dessert, head to Vosges Haut-Chocolat for chocolate truffles. At XPresSpa, which is open from 9 a.m.-9 p.m., you can get a quick massage or spa treatment before boarding. Designed exclusively for airports, the spa prides itself on easy check-ins and quick service. For starters, Midway is offering its passengers a free cup of hot cocoa on both Wednesday and Tuesday, Dec. 2. Need a real meal? Take a load off at full-service restaurant, Harry Caray's Seventh Inning Stretch, or order a jumbo Chicago-style hot dog from Gold Coast Dogs to go. Next, check out the Battle of Midway Memorial, an exhibit installed in honor of U.S. World War II veterans at the Battle of Midway. Through video kiosks, photos and a SBD Dauntless aircraft dangling from the ceiling, the exhibit tells the story of Chicago pilots and engineers during the war. Other permanent exhibits include one dedicated to the Chicago area Marines who were killed in bombing attacks in Beirut, Lebanon, in 1983 as well as a photo series by Peter Menzel depicting families around the globe in everyday situations. Both are in Concourse C.
There's a bunch of public art on display at Midway, too. Take Kathleen Eaton's paintings and prints depicting Chicago neighborhoods, for example. Located on the Mezzanine level near the pedestrian bridge, Eaton's paintings of Hyde Park and Bucktown contrast imagination and reality. 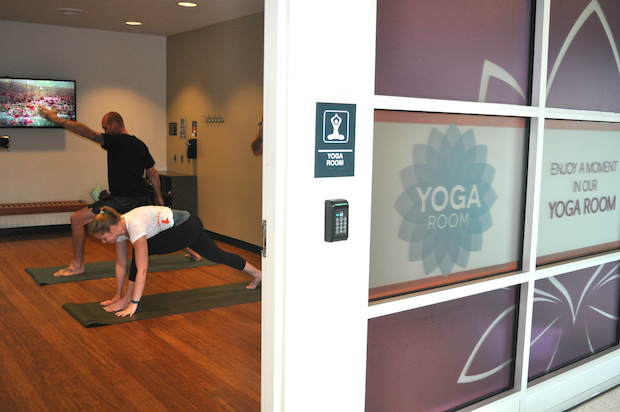 And in September, Midway added its own free yoga room and a room specifically designed for nursing mothers. The nursing room is the size of a small bathroom, outfitted with a sink, chair, an open countertop and a phone for making emergency calls.